Nourish your baby's development with BrainStrong Prenatal. BrainStrong Prenatal also contains 100% of the recommended daily dose of folic acid for fetal health and development. ** If you are actively seeking to become pregnant, taking BrainStrong Prenatal prior to pregnancy, helps to start nourishing your unborn baby's brain development from the earliest stage possible. 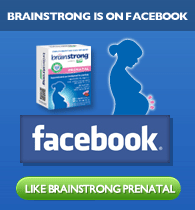 To learn more about BrainStrong Prenatal click here. The International Society for the Study of Fatty Acids and Lipids recommends an intake of at least 300mg/day of DHA for pregnant and nursing women.